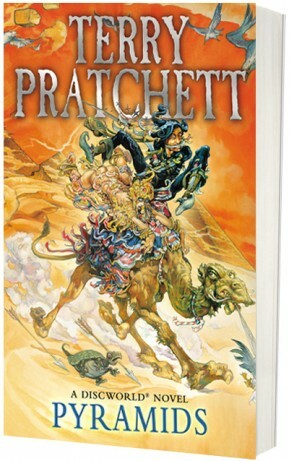 I’ve just read my first Terry Pratchett novel and absolutely loved it. Reading it in the Sinai definitely added a dimension to it. It’s about religion and belief, has a camel as one of its main characters that also happens to be the world’s greatest mathematician. And as it’s a Pratchett novel it is all about the nature of reality and our relationship with it. Today, walking Cairo streets, it suddenly struck me that the Egypt described in the story could be read as a political commentary. Published in 1989 such a perspective can only be in the eye of the beholder. On the other hand: in the sci-fi, multiverse quantum world that Pratchett’s word magic brings about, such things happen all the time. I’m pretty sure no Egypt watcher has yet come up with this connection so I finally seem to have hit something original. His Egypt is caught in a time warp. A country with a history thousands of years longer than that of any other but it’s recycling old time all the time, no new time is added, the pyramids ‘burn it off’ every night. Life has become stagnant, ritual is everything, even the air is stale. Seems like a good description of the revolving door revolutionary times that the actual country is going through. His Egypt manages to escape in the end. So there is hope. However, it takes a female pharaoh, something I only see happening in the further away future in this Egypt. You may challenge the originality of the above. The connection is far-fetched and tenuous. True. But it’s fun. It feels like a breath of fresh air from pundit political analysis, and anyone who has walked Cairo streets will know that fresh air is very much needed here. And yes these are comments on originality and on Egypt that collectively feels tied to the whipping post. This entry was posted in psychology, society and tagged Allman Brothers, Egypt, Frank Zappa, originality, political analysis, Terry Pratchett. Bookmark the permalink.